The New York Times Prods Croatia. Gently. Rescind Marko Perkovic Thompson’s [Australian] Visa, Senator Evans! Thousands of people giving the Nazi salute? It sounds like a nightmare. 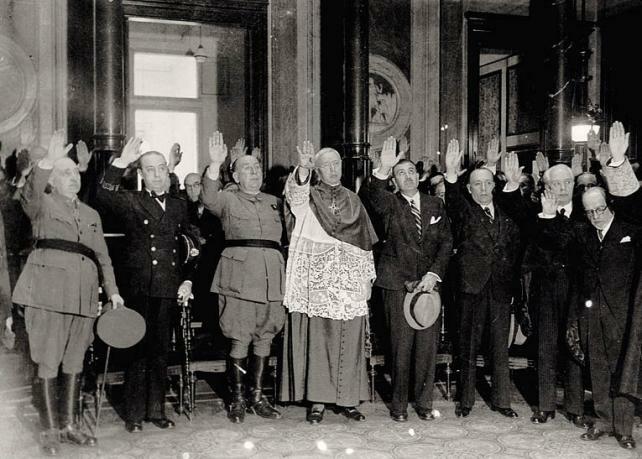 Spanish authorities, civil and religious, giving fascist salute. …and the Ustashe in Croatia, who combined the fascist salute with what the Times calls “a well-known slogan from World War II,” as demonstrated in the video below, shot before the start of the Zagreb Thompson concert. Since the video is in Serbo-Croatian, let me give you the gist: People are talking, waiting for the concert to begin, and some begin to chant the Ustashe’s two-part slogan, with some Croats shouting ‘Za dom,’ meaning ‘For home,’ and others answering ‘Spremni,’ meaning ‘Ready.’ As they chant, the crowd members thrust their arms upwards and forward, their numbers increasing until most of the crowd is giving the fascist salute. Tens of thousands of Croats – the Maksimir stadium holds 60,000 and it was filled – giving the Ustasha fascist salute, and this in a Croatia whose World War II regime, installed by the invading Nazi German army, killed well over a million ‘foreign elements,’ Serbs, Roma ('Gypsies'), Jews. For me this is horrible. Not so for the New York Times. Throughout their news-analysis, the Times presents arguments – their own, those of a Croatian government minister, of Thompson leader Marko Perkovic, and of a few of his critics and defenders – all effectively weakening the impact of the opening paragraph about those thousands giving the Nazi salute. We get the overall impression that, while there may be a problem here, it isn't serious. The Times begins trying to create this impression in their headline: “Fascist Overtones from Blithely Oblivious Rock Fans.” Meaning: the Croats don't understand the 'implications' of the Croatian fascist salute. The young are oblivious; the old are insensitive. Nobody means any harm. This concert-rally isn't the tip of the iceberg of a fascism that only now threatens Croatia. It is the tip of the iceberg of – Croatia. Since seceding from Yugoslavia in 1991, Croatia has been dominated by Ustasha ideas and pursued Ustasha goals. The Croatian secessionists even exhumed the World War II Ustasha symbols although by doing so they risked being internationally identified as fascists, since it is easier for outsiders to spot the Ustasha slogans, salute, flag, currency and uniforms than it is for them to recognize Ustasha ideas and goals. The Croats at this concert, mostly born around the time Croatia seceded from Yugoslavia, are not oblivious. They are the product of 'independent' Croatia, the eloquent evidence of its nature. They give the Nazi salute because they were raised as Croatian clerical-fascists. For them, the Ustashe are national-religious heroes: role models. I will show that in this article the Times has reduced, by about 90%, and without explanation, the number of victims of Croatian Ustasha death camps, as reported by the New York Times prior to Croatian secession in 1991. While it is true that racist murder is an abomination, whether the racists murder one person or a million, the numbers make an immense difference. For one thing, by drastically reducing the extent of Ustasha crimes, the Times lessens the impact of their own claim that masses of Croats are insensitive regarding Ustashe crimes, not to mention my argument, that the Ustasha are back in power in today's Croatia, albeit with a bizarre coating of liberal rhetoric. Young Croats are not just "blithely oblivious"
How could Croats be “oblivious” to the “fascist overtones” of giving the Croatian Ustasha salute, as the Times claims? Does the Times think they are comatose? Or perhaps that we are? Croatia was an ally of Nazi Germany. Of course, an American, Indian or Chinese might not know this, but Croats know. Croatia sent thousands of volunteers - fathers, grandfathers and great grandfathers of people in Croatia today - to the Russian front. These Ustasha volunteers hacked a path of terror through Ukraine and Russia and fought beside the German Nazis at Stalingrad, where 600,000 Soviets were killed: the decisive battle of World War II. Based on the terrible struggle of ordinary people at Stalingrad, unequalled in any battle in modern times, the Soviets beat the Nazi Germans and their allies, such as the Croatian Ustashe. We owe an unpayable debt to the people of Stalingrad. If the Croatian volunteers and their friends had won, some of us might now be giving the Nazi salute, and many of us would be dead. I will prove that in the 1990s the Croatian Defense Department produced a book, distributed by Croatia's biggest schoolbook company, celebrating the Croatian Ustasha military, including, indeed especially, the Ustashe who volunteered to fight at Stalingrad. Using this book and other evidence I will show that the concert-goers had to understand the meaning of the Nazi salute. Is singer Marko Perkovic oblivious too? In the excerpt quoted above, the Times seems neutral. But earlier in "Blithely Oblivious," the Times supports Perkovic, reporting that the "Home! Ready!" chant and fascist salute that Perkovic led at the Zagreb concert "seemed to lack any conscious political overtones.” So Perkovic is oblivious too. I will show that the Times ignores the evidence in their own article that Perkovic is lying. Even more serious: the Times fails to report that for many years the "soft-spoken" Marko Perkovic has sung songs celebrating the Croatian Holocaust. This is not just a rumor. After first claiming he could not remember whether he had sung such songs, on Jan. 7, 2004 Marko Perkovic published a 'Dear friends' letter on the Thompson homepage stating, indeed boasting, that he had, and what of it? As you will see, in one of these songs Perkovic fondly recalls a Ustasha "slaughterhouse" and says "I am Ustasha!" Since now, three years later, the Perkovic letter is not on the Thompson home page, and since Perkovic denies ever encouraging support for the Ustashe, how does TENC know he made this "Dear Friends" confession in 2004? That it's not just rumor? Are these songs really monstrous enough to warrant calling Perkovic's "Dear friends" letter a confession? And if they are so bad, why did Perkovic admit singing them? Let us consider the second question first. 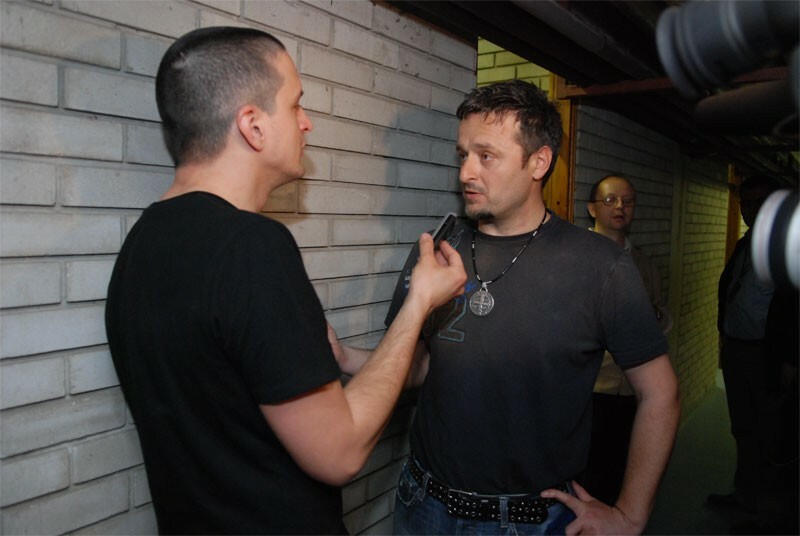 Despite the boastful tone of his "Dear friends" letter, Perkovic was forced to write it in response to a broadside attack from the muckraking  Croatian website index.hr, which accused him of singing songs of love for fascist murder. A) “Here comes dawn, here comes day, here come Jure and Boban,” in which Perkovic lovingly recalls Jure Francetić and Rafael Boban, commanders of Croatia's own SS military force (that's 'SS' as in German Nazi SS), the Black Legion, which specialized in slaughtering hundreds of thousands of Serbs, Roma (“Gypsies”) and Jews in their villages. This apart from the 600,000 to 700,000 or more whom the Ustashe butchered in death camps. "'Jasenovac' and 'Here Comes Dawn' Were Sung by Thompson and Supporting Vocalist Tiho Orlic in Concert in Osijek In 2002"
"After the publication of the text [of the first article] we received numerous emails in which visitors, wishing to remain anonymous, mentioned that they were present at a performance of the same song by Thompson in Oscar Disco in Offenbach near Frankfurt in 2001, at a concert in Cleveland, a concert on the occasion of the Days of Mourning in Kupres [Bosnia-Herzegovina], etc." "...expressing our rebellious spirit and determination to deal with those [Serbian] beasts and finally to defeat them, and these songs caused fear among them." After 2000, said Perkovic, he sang his odes to the Holocaust in order to fight communism. To access Thompson's Jan. 2004 home page, with the "Dear Friends" (Dragi prijatelji) confession in Serbo-Croatian, or to read an English translation, please see footnote . For links to index.hr's three Thompson exposés in Serbo-Croatian, please see footnote . Next we will consider: what is so bad about the song "Jasenovac"? And then we will ask: why, as the Times also forgot to report, is the Croatian Catholic church sponsoring Marko Perkovic and his band Thompson? 9) Croatian 'poglavnik' (fuehrer) Pavelic greeting Adolph Hitler. The movie footage is about Nazism, yet the music is cheerful and light-hearted: the music of celebration. The Croatian government (for example, in its recent exhibition at Jasenovac ) has tried to downplay this nightmare by portraying Jasenovac as a labor camp where some tens, not hundreds of thousands, died, due to some bad conditions or abuse by individual Ustashe. A harsh labor camp, perhaps, but not a complex of extermination camps set up for the purpose of eliminating the three target groups (Serbs, Jews, Roma). But Perkovic attempts no such revision. He is proud of the extermination campaign. He calls Jasenovac and Stara Gradiška "the house of Maks' butchers." Maks was Vjekoslav 'Maks' Luburić, top Jasenovac commander, and his butchers were the Ustashe. Similarly Perkovic sings of "a slaughterhouse in Capljina." Capljina, a town near the Neretva River in Herzegovina, is in the area to which the Ustashe gave the name 'Herzeg-Bosna.' This is a part of Herzegovina that the Black Legion SS rendered virtually serbenrein during World War II. (The largest and best-known town in the area is Mostar.) The worst Ustasha murderers came from 'Herzeg-Bosna,' through which the river Neretva flows to the Adriatic. Imotski, a town in Perkovic's home region of Dalmatia, is also part of the Ustasha-invented 'Herzeg-Bosna.' Jure Francetić commanded the Croatian Black Legion SS, made up of volunteers - the worst killers. Perkovic's point: the mass-murdering Ustasha SS volunteers are back. The Ustashe had one 'craft': slaughter. They designed a special knife, the Srbosjek (pronounced 'Serbosyek'), with a small blade, curved for cutting throats, attached to a half-glove that hid the blade from sight so victims wouldn't be forewarned. The next few lines will be confusing unless you know that, when, in the middle of World War II, the Ustashe realized the Nazis were going to lose, they divided into two groups. One group (let us call them the diehards) kept fighting even after the war ended, then went into exile, setting up a well-heeled Ustasha apparatus in the Croatian Diaspora from Canada to Australia. Supported and protected by the Vatican and Western states, the Ustasha flourished, conducting terrorist attacks on Yugoslav diplomats and non-Ustasha Croats, and then, in the late 1980s, helped finance and lead the secessionist movement that rules Croatia today. The other Ustasha group (let us call them the chameleons) stayed in Croatia, distancing themselves from the diehards, even pretending to be Partisans. By war's end, as current Croatian president Mesić has boasted , they had done such a good job that Croatia, a Nazi slaughterhouse/butcher state (as Perkovic puts it), was able to sit at the winner's table. The result: Croatia and its key institutions paid virtually no price for killing well over a million people. Croatia returned none of the billions (in today's dollars) stolen from Serbs, Jews and Roma. Croatia paid no reparations. And the huge Ustasha apparatus, closely entwined with the Catholic Church, suffered relatively little: after a brief period of some punishment right after World War II, thousands of Ustashe were left free and many - especially the chameleons - were active in the institutions of socialist Yugoslavia, despite having committed crimes on a scale that, in World War II Europe, was matched only by the Nazis in Poland and the eastern Soviet Union. In 1995, after Croatian military forces fulfilled the Ustasha dream of driving hundreds of thousands of Serbs from their ancestral lands in and near Croatia, Croatia's sponsors – Germany, the Vatican and the US – began pressing Croatian leaders to tone down displays of Ustasha symbols and adopt 'civil society' rhetoric. By today, ten years later, the Croatian establishment has partly acquiesced, at least somewhat, at least in public. Chameleons all. Their attempts at verbal self-reinvention make for black humor, as when Marko Perkovic, the Ustasha prima donna, tells the Times he never encouraged fascism. Who him? Perkovic ends with an affectionate goodbye to Jasenovac and Ante Pavelic, the dictator who boasted that his Croatia was first to ‘solve’ the Jewish ‘problem.’ The village of Metkovic, mentioned below, is included in the area of so-called 'Herzeg-Bosna,' that geographical invention of the Ustashe. Metkovic is located near the mouth of the Neretva River, close to a very small part of the Adriatic coast that communist chief Tito had given to the Yugoslav Republic, Bosnia-Herzegovina . Catholic church? What Catholic church? TENC can not argue that in "Blithely Oblivious" the Times misinforms its readers about the role of the Catholic church regarding Marko Perkovic since the article makes no mention of the Catholic church. This is remarkable because just two months before the Times article appeared, the Catholic church was involved in a major fight over a church-sponsored concert in Sarajevo, Bosnia, a concert featuring none other than Marko Perkovic. As we shall see, one of the issues that came up in that fight was whether Marko Perkovic had sung the "Jasenovac" song. In April 2007, the Croatian Catholic Charities Association (Hrvatsko katoličko dobrotvorno društvo or HKDD) - translation: the Croatian Catholic church - announced they were sponsoring a Thompson concert to be held in Sarajevo, in the Zetra Arena, site of the 1984 Olympics. The date: May 10. The occasion: the tenth anniversary of Pope John Paul II's visit to Sarajevo. A major event. On May 9, one day before the concert, following protests, and claiming concerns for security, the Catholic Charities organization - in other words, the Catholic church - cancelled the concert. "The question is this: what is he [i.e., Perkovic -J.I.] going to sing about? Killing Serbs, killing Muslims?" Zuroff's point was partly valid; partly because, while it is clear that Perkovic has sung songs rejoicing in the killing of Serbs, I have seen zero evidence of him singing about killing Muslims. Perkovic's most horrible songs are celebrations of mass murder in Ustasha greater Croatia during the Holocaust. In that ultra-Catholic statelet, the Ustasha rulers gave Muslims the protected 'racial' designation of 'Croats of the Muslim faith.' Perkovic's favorite Ustasha group, the Black Legion SS, targeted them for recruitment. Recruitment, not death. Not that the Ustashe were disinterested in Muslims. Below is a Croatian Black Legion SS recruiting poster. Notice the fez, the cap denoting Islamic extremism. Notice the minaret (tower of a mosque) in the mid-right background. The message to fascists among the Muslims: Join your big brothers, the fascists among Catholics. A recruiting poster for the Croatian Ustasha SS (as in Nazi SS) Black Legion. The poster was aimed in part at Bosnian Muslims; hence, one soldier is shown wearing a fez, the hat of fanatical Islam, and the town in the background includes a minaret (middle-right), part of a mosque. The top line reads: "Croats of Herzeg-Bosnia!" Underneath is the crooked double S of the Nazi SS, plus the Ustasha checkerboard flag, brought back when Croatia seceded from Yugoslavia, for the second time, in 1991. Two soldiers, presumably a Catholic and a Muslim, trample the Communist flag. The text reads: "The Great leaders Adolf Hitler and poglavnik [fuehrer] Dr. Ante Pavelic are calling you to defend your homes. 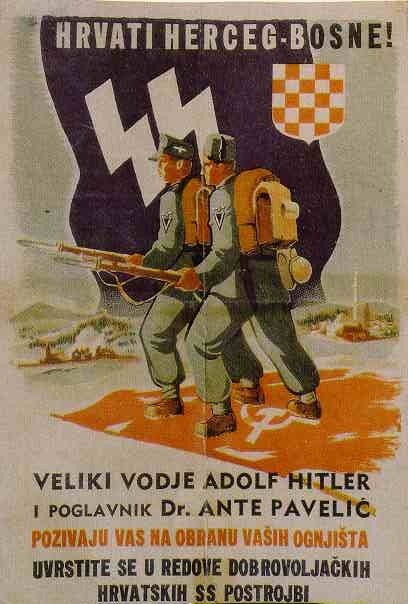 Join the volunteer units of Croatian SS." According to javno.com, Zuroff also said: "Thompson does not do Croatia credit." A society in which the Ustashe, again returned to power, have again decimated the ranks  of real anti-fascist intellectuals, of whatever ethnicity, and in which the new Ustashe have eliminated virtually all Serbs whose family lines were not completely wiped out the last time around. And Zuroff says Perkovic does not do credit to this Croatia? Maybe for this Croatia, Marko Perkovic is the perfect credit rating. "The organiser of the concert, [Reverend] Don Anto Jelic of the Croatian Catholic Charity Society, is embittered by Zuroff’s statements. "'I think such statements are malevolent. Let him prove that Thompson ever sang against Serbs, Muslims or Jews' – says Don Jelic, who had told Javno earlier that he had not heard a recording of Thompson singing the notorious “Jasenovac i Gradiška Stara” song, adding that the question should be put to Thompson.'" Second, given a charity concert commemorating an event as important to the Catholic hierarchy as the tenth anniversary of the pope's visit to Sarajevo, and a star as prominent and notorious for Ustasha politics as Perkovic, it is not believable that Rev. Jelic decided to stage this concert using the venue of Sarajevo's Olympic stadium without the knowledge of Croatian Cardinal Josip Bozanic, and therefore of the Vatican. By deciding in this dramatic fashion to give their blessing to Perkovic, the church hierarchy was not merely embracing a prominent fascist, because Perkovic is not merely a prominent fascist. He is a devoutly religious prominent fascist. Marko Perkovic interviewed at concert in Maksimir stadium, July 17. At concerts, Perkovic always wears a St. Benedict's Medallion, most intense of Catholic medals. The Thompson home page features images of the medallion and a Catholic church that Perkovic is raising money to build. His trademark crusader's sword symbolizes the Catholic church militant. Since Holocaust fascism in Croatia was clerical fascism, the big question is: where does the Catholic church hierarchy stand on Thompson. The unfortunate answer: they champion him. And the Catholic church didn't just choose Perkovic as their standard bearer, knowing full well that he would remind people that the Ustashe were clerical fascists, i.e., knowing full well that this would mean picking a big fight. They did more; they used the inevitable resulting storm of controversy as an occasion to publicly and haughtily dismiss criticisms of Perkovic. Thus Rev. Jelic's contemptuous response to Zuroff: "Let him prove that Thompson ever sang against Serbs, Muslims or Jews." Do Rev. Jelic and the hierarchy that he represents - do they claim they are unaware of the huge scandal in 2003-2004, in which index.hr exposed Perkovic as singing songs lauding the Holocaust? "therefore this makes their [index.hr's] sensational discovery ridiculous to say the least." -- From English translation, below. The Perkovic "Dear friends" letter has been deleted from the Thompson website, so if the Vatican and Cardinal Bozanic missed them, they will want to check footnote  where we link to the TENC backup of Thompson's January 2004 home page, which includes the Perkovic confession. And, in case the Vatican has difficulty with the Serbo-Croatian language - because that is what the language spoken in Croatia (and Serbia and Bosnia) was called before the German-Vatican strategy of destroying Yugoslavia dictated the discovery of three (functionally identical) languages ludicrously named Serbian, Croatian and Bosnian - in case the clerical gentlemen have problems with Serbo-Croatian, thus explaining why they did not read Perkovic's confession, which was written in that tongue, and hence are unaware of his clerical-fascist politics - in that case, no problem. Because we have posted the translation in English, below. Third, someone might argue that by promoting Perkovic and scornfully defending him against charges of violent racism, the Catholic hierarchy does not, as Mr. Zuroff might put it, do itself credit. But then someone else might make the very different point that it is one's actions which determine the credit one is due. And you know, someone else might have a point. "For Poglavnik and Christ, Against Communism!!" The head in the hat is Ante Pavelic, "poglavnik" (fuehrer) of Croatia. If this video is removed from youtube, we will upload our copy and post the link here. If the youtube video is removed and we haven't yet posted our link, please let us know at emperorsclothes@tenc.net Thanks. "From 1 to 12 October 2007 Croatia will be the scene of Noble Midas 07, the largest and most important international military manoeuvre to be held in Croatia since its independence. Some 9,000 soldiers from NATO's Response Force and marine commandos, 50 warships, an aircraft carrier, amphibious vehicles, frigates, cruisers, submarines and some 60 NATO member aircraft will stage the largest NATO military exercise of the year in the northern and central Adriatic Sea." The Marko Perkovic confession/boast is the third item down on that page. It begins "DRAGI PRIJATELJI!" Below is an English translation of the Perkovic letter. (It was translated by Sinisa Djuric from the presently unavailable pavelicpapers.com website.) If you like, you can go direct to the English translation. A) In his Jan. 7, 2004 "Dear friends" letter, Perkovic writes that the index.hr exposé is ridiculous because he never tried to hide the fact that he sang "Jasenovac" and "Here comes dawn." I haven't seen the Novi List interview, but: a) the rest of what index.hr reported is true, so what reason do we have to think they made this up? b) If they pretended Perkovic was feigning amnesia when he wasn't, they would have been discredited, so what would have been the point? C) We know Perkovic lied to the New York Times about never promoting fascism, so why take his word (that he never tried to deny singing these songs) over that of index.hr (that he feigned amnesia)? Conclusion: it seems reasonable to conclude that Perkovic's claim that he was always open about singing "Jasenovac" was a lie to save face through bravado. B) In his 2004 "Dear friends" letter, Perkovic presents two justifications for singing songs lauding the Holocaust. First, he says he sang them during the 1990s as a weapon of resistance to (supposed) Serbian aggression. Second, he says that after 2000, he sang them as a weapon against communism. Thus he puts forward his 'we had to stand up to the Serbs' justification. This is a long retreat from the explicit racism expressed in the song "Jasenovac," and even from statements made during the 1990s by politicians supposedly less extreme than Perkovic. For example, consider the 1995 speech Croatian president Tudjman made during a railroad tour of Croatia, celebrating the bloody expulsion of a quarter million Serbs from the Krajina region, bordering Croatia. Tudjman was the leader of the HDZ (Hrvatska Demokratska Zajednica or Croatian Democratic Union) which now runs Croatia, supposedly less extreme than the HSP (Hrvatska Stranka Prava or Croatian Party of Rights), which was always the most openly Ustasha. Perkovic is an HSP cultural icon. "And [applause - BBC] there can be no return to the past, to the times when they the Serbs were spreading cancer in the heart of Croatia, cancer which was destroying the Croatian national being and which did not allow the Croatian people to be the master in its own house and did not allow Croatia to lead an independent and sovereign life under this wide, blue sky and within the world community of sovereign nations." According to Tudjman, the Serbs were "cancer" - exactly the sort of disease metaphor Nazi-types use when describing 'racial' enemies. Straight-forward Ustasha stuff, no pretense of standing up to supposed Serbian aggression. Rather, the presence of Serbs is in itself an aggression against some undefined (because indefinable) Croatian "national being." It is worth noting that Tudjman spoke in the same way that fascist organizers and parties, such as the British National Party (BNP) now speak, spreading hysteria about the presence of 'foreign elements,' i.e., non-white immigrants in countries portrayed as the property of some "European race," a new invention, to replace all the old little races, or perhaps not, perhaps just a restatement of that oldest standby, the "white race." Anyway, in contrast to Tudjman in 1995, Perkovic in 2004 virtually cowered, giving in to Western pressure to dissemble even as he struck a false-macho pose of boastfully defending his singing of fascist songs. Carry Serbs into the blue Adriatic"
What does that have to do with communism? * no compensation for the theft and destruction of the Serbs' property, worth billions, not to mention for the torture and murder of thousands. Just a government with a prettier face so that the 'international community' could sell ordinary people in the West the idea that antifascism was making headway in Croatia. "First of all, I would like to emphasize to you that my official website is the only true source of information about me and my opinion and you can find this in articles edited by the administrator. "We are witnesses of yet another insane campaign, which, because of their election defeat, hysterical Communists and their collaborators are starting against me. "This time they have discovered warm water; They have 'discovered' that I've been singing songs like 'Here Comes Dawn...', 'Jasenovac...' and similar. "I am not the author of these songs, but I have been singing them, which is well known to all of us, during a certain period everywhere in Croatian squares and in halls without hiding, therefore this makes their sensational discovery ridiculous to say the least. "And this is when and why I've been singing them. These songs I've been singing with hundreds of thousands of Croats during the Patriotic War when Chetnik [i.e., Serbian - J.I.] aggression endangered the very existence of the Croatian state and the people, when thousands of Croatian young men died defending our values and lives from Chetnik knives. "These songs we have been singing in spite to the enemy, expressing our rebellious spirit and determination to stand up to those beasts and to finally defeat them, and these songs caused fear among them. "After the 3rd of January 2000 when Croatia stumbled and power was taken over by the Communists, there were unbelievable derogations, insults, humiliations and persecutions of Croatian defenders, generals, intellectuals and prominent public personalities and everything sacred to the Croatian people. All over Croatia 'Over forests and hills' [a Partizan song - S.D.] was being sung, the Croatian army had been declared an aggressor, warrants were issued, bounties were offered for their betrayal... Then we were again saying to the vampire-like Communists, with that and similar songs, that we are not afraid of them and that we will resist them and protect our values at any cost. "And today, when they are finally on their knees, they are trying with these sorts of low blows and by declaring me a Fascist, Nazi and similar, to cause as much harm as possible to me and to the entire homeland. "Dear friends, do not pay attention to them, they are a matter of the past and never again will Communists and Chetniks tell us what we can and cannot sing in our homeland. "Dear friends, we should turn to the future. Thank God, now again we have Croatian authorities and we have no more need to express our dissatisfaction in this or similar ways, but we need to spend all our energy by contributing to the common welfare and progress of our nation and our state." Muckraking • noun the action of searching out and publicizing scandal about famous people. — ORIGIN coined by President Theodore Roosevelt in a speech (1906) alluding to the man with the muck rake in Bunyan’s Pilgrim’s Progress. If this video is removed from youtube, we will upload our own copy and post the link here. If you find that the youtube video has been removed and we haven't posted the new link, please write emperorsclothes@tenc.net Thanks. The information comes from my as yet unpublished interview of Prof. Srboljub Zivanovic, who was part of a team of three forensic anthropologists and an archeologist who excavated a sampling of mass graves at Jasenovac in 1964. Zivanovic emphasized that the vast majority of victims were murdered without ever having entered the death camp complex. Did you notice that right in the title of this document, the Holocaust Museum uses its authority to set an upper limit on the number of possible possible victims at Jasenovac? No more than 100,000 can be said to have been murdered in that Ustasha death camp complex. The hidden politics here: if 100,000 were killed, Jasenovac could have been a brutal labor camp. But if 600,000 or more were killed, in a territory of about 6 million, as was reported before 1991 by every non-Ustasha source from the New York Times to the Encyclopedia of the Holocaust, then Jasenovac had to have been set up as an extermination center. If 600,000 were killed, then masses of Croats must have been involved, actively and passively, and if they were, then so was Croatia's main moral authority, the Catholic Church. This especially because the Ustasha exiles who took power in April 1941 were a small force. How did they succeed in a fascist Croatia that was not subject to German occupation (as Serbia was) absent the support of the most influential traditional organizations? And if the Croatian church morally supported the Ustasha extermination campaign what about the Vatican? So a lot of dominos may tumble if the figure of 600,000 or more, universally accepted outside pro-Ustasha circles by scholars and in the (rare) media reports on Jasenovac, prior to the 1990s - a lot may tumble if the figure of 600,000 or more is not successfully, drastically reduced. This explains the odd note struck in the document's title - the statement that "up to 100,000" were killed. If the authors don't know the number, how can they know the upper limit of the number? They could say, "at least 100,000," but how can they know it is no more than 100,000? This is not the language of honest historical research; it is the language of historical negotiation. The USHMM is telling the victim-side of this 'negotiation' (Serbs, Jews, Roma): "OK, you can mourn your victims, and we will even increase the numbers - we'll up the figures as much as double what Franjo Tudjman wrote in his book Wastelands - but that's as far as we're prepared to go. 100,000 and not one victim more!" Negotiation, not history; but then current Jasenovac 'research' has nothing to do with history, hence the political decision to add the category "Muslim religion" to the Ustashe's targeted groups, even though the Ustashe accepted Muslims as 'Croats of the Muslim faith.' Indeed, the Black Legion tried to recruit Muslims - hence, in the Black Legion SS recruiting poster, above, there is a mosque in the background - and they especially wanted to recruit fanatical Muslims - hence, in said recruiting poster, one of the soldiers wears a fez, symbol of Muslim extremism. The Ustashe could have persecuted the religion of Islam, or they could have recruited the most fanatical Muslims, but does the Holocaust Museum (and Mr. Zuroff) contend they did both? Of course, the Ustashe undoubtedly killed some Muslims who were accused of being Communists, a blanket term used to cover all opponents. Some people of every ethnicity and religion were accused of being Communists and were killed, if they got caught opposing the Ustashe. But that is a horse of a different color. Donations from our readers make TENC possible!